Dozens of companies took part in the annual Heroes 4 Hire event Tuesday at Rentschler Field to talk with veterans looking for jobs. More than 100 employers and 30 service providers were looking to hire our heroes in East Hartford Tuesday. 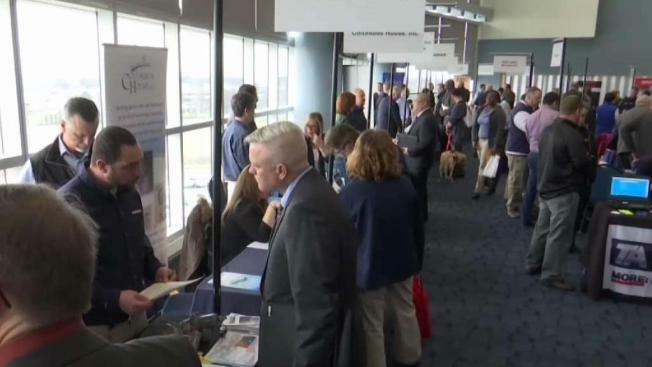 The annual Heroes 4 Hire veterans career fair brought more than 1,000 people into Rentschler Field, according to a spokesperson for the Connecticut Department of Labor, that managed the event. The former Army specialist is in search of a new job. “Working in the military, it advances your level of thinking and everything,” Briley said. Which he, veterans, reservists, even military family members hope gave them a leg up. “Veterans definitely get hired due to this event,” said Tim Rockefeller, a local veteran’s employment representative for the Connecticut Department of Labor. A veterans team from the state Department of Labor was on hand to help veterans create strong resumes so employers could see the valuable experience and skills they have to offer, according to Rockefeller, who served the Marine Corps from 2002 to 2006. This is the largest veteran’s career fair in New England, he said. Upstairs was Save-A-Suit. The non-profit provided veterans with professional, donated suits and other business attire for free, to help them dress for their interviews and to professionally network. “It makes you feel a little more confident. You got to dress for the role,” said Sean Byrne, a Marine Corps veteran who was fitted with a suit before going to the career fair. It’s the first year Save-A-Suit partnered with the state Department of Labor for this event. “It’s a little too good to be true. So it’s pretty amazing,” Byrne, a former sergeant, said. A photographer also took professional photos for attendees LinkedIn profiles. Those in attendance appreciated the opportunities to meet potential employers face-to-face, especially since the majority of job applications are electronic. Companies including Walgreens, Mohegan Sun, UPS, Vista Home Improvement, and state and local police were on hand. “All the companies are here. You can choose and meet everybody. It’s like a network to be able to get your foot in the door,” said Specialist Ely Peña of the Connecticut Army National Guard who was looking for a civilian job. The Heroes 4 Hire event has been going on for 15 years.